In a very rare and important visit to the Bay Area, saxophonist Abraham Burton along with bassist Eric Revis and drummer Nasheet Waits bring their dynamic trio to the Eastside Cultural Center on Sunday May 22nd. Abraham, a New York City native, is a graduate of the La Guardia High School of Performing Arts. He pursued his development toward a life in music under the mentorship and guidance of the great Jackie McLean at the University of Hartford’s Hartt School of Music where he received his Bachelor’s degree in music and learned from Mr. McLean the importance of studying jazz history. By the early Nineties his professional career was launched with the renowned drummer Art Taylor and he has never looked back. Burton has worked with John Hicks, Rashied Ali, Horace Tapscott, Marc Cary, Michael Carvin and many others too numerous to name. 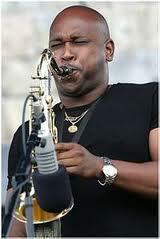 He is currently a fixture in the Louis Hayes group, the Mingus Big Band and has recorded extensively with both. This trio of Burton, Revis and Waits as well-season heavyweights, represents another significant addition to the wonderful lineage of saxophone led trios committed to transforming the future of the music while remaining steeped in its traditionally deep roots. Abraham and Nasheet, friends since early childhood share that much cherished trait of intuitive communication and when joined by the ever cognitive, spirit heavy Rivas, they create a musical environment ripe with both organic individual adventures and limitless possibilities for group improvisation. Burton, probing and spiritual, Revis, soulful and assertive, Waits, articulate and ubiquitous have found their voices and are now willing explorers eager to take risk and in the process, revitalize/redefine the art form permanently leaving their unique imprint on its history. The setting at the Eastside Cultural Center is an intimate one which embraces and encourages the musicians in ways that allows for their best performances. This really is a concert that you will not want to miss.